The best way to get a true glimpse into any city you’re visiting this fall is to try the local specialty, and there is no better way to do that in America than by trying the area’s must-have sandwich. Whether it’s a lobster roll in Maine or a pastrami sandwich in New York City, every regional sandwich tells a story of the place and the people serving and eating it. 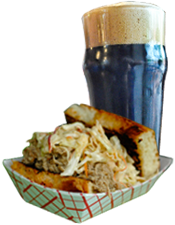 We can think of no better way to wash down your favorite sandwich than with a craft beer from a nearby brewery. That’s exactly why we paired six classic American sandwiches with their best local craft beer counterparts for the ultimate regional experience! You may visit The Liberty Bell and attempt to sprint up the famous Rocky steps, but if you really want a taste of the City of Brotherly Love, you’ll be indulging in a Philly cheesesteak. The soft, chewy bread is filled with grilled rib-eye beef, either sliced or chopped, depending on who you ask. The sandwich is classically finished off “wit” onions and cheese including provolone or more commonly, bright orange Cheese Whiz. 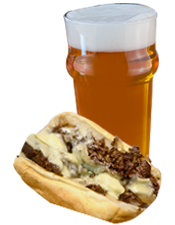 Although flavorful, a cheesesteak has a mild taste that pairs perfectly with a pale ale. The slight hoppiness stands up to the onions and hearty meat, and the cleaner finish is refreshing after the salty beef and cheese. It’s satisfying but not overpowering, just like the sandwich. You haven’t eaten barbeque until you’ve had it in the South, and the Carolinas often serve up their barbeque in their classic pulled pork sandwich. With a love and appreciation for pork, Carolina natives take their time by slow-smoking it for hours to the point that it literally falls apart. With an explosion of flavor from the meat, you need a beer to compliment its potency, so grab a porter or smoked beer. The meat is often smoked with various types of wood to infuse the meat with that smokey, deep taste. The sauce it’s slathered in packs a punch as well. You’ll either get some heat with a traditional barbeque sauce, or a tangy twist with South Carolina’s gold sauce, consisting of mustard and vinegar, so what better accompaniment than a smokey, burnt-flavored beer. Eastern European and Jewish immigrants brought over the savory Pastrami sandwich when they settled in New York City, and it’s still loved today. The meat is brined, smoked, boiled and steamed, then seasoned with garlic, coriander, black pepper, paprika, cloves and mustard seed. After all that, it’s served on rye bread and topped with mustard for a palate pleasing lunch. With all of those powerful seasonings, you’ll need a more pungent beer like an IPA. The bitterness of an IPA won’t get lost amongst the liberally seasoned and smoked deli meat, rye bread and tangy mustard. 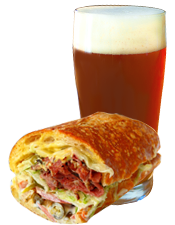 The citrusy finish from the beer will quench your thirst after the salty pastrami. 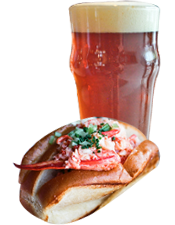 Summer on the East Coast means lobster rolls: ultra succulent, fresh lobster filling a New England-style hot dog bun. If you find yourself in Maine, you’ll be having your lobster bathed in a creamy mayo, but in Connecticut, it’s accompanied by a silky butter. Butter or mayo, which seasonings, and whether to add fresh herbs or crunchy celery is debated, but no doubt you’ll feel like you are taking a bite of the ocean with this coastal delight. What better way to enjoy a seasonal food than with a seasonal brew. A summer or blonde ale are a good match as they ensure the delicate seafood is still the star since these beers have a light, malty taste and a very mild fruitiness. 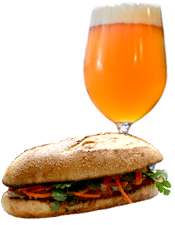 Bahn Mi is a perfect example of California cuisine. It’s generally healthy and filled with fresh vegetables including carrots, cucumber and cilantro. The torpedo-shaped baguette is also packed with Vietnamese ingredients, which is indicative of the large Asian population that calls the West Coast home. The vibrant, fresh taste of the cilantro, chili, and other vegetables needs a lighter, fruity counterpart like a hefeweizen, or for a bit of more malt character, a dunkelweizen. The hints of flavors in these wheat-based beers, like banana and vanilla, fit right in with the natural sweetness from the carrots. With the absurd amount of toppings on a Chicago-style hot dog and the mammoth-sized deep dish pizza, it’s obvious that Chicagoans like a rib-sticking meal, and the classic sandwich coming out of the Windy City is no different. The Italian beef sandwich is thinly sliced, tender beef, drowned in its own liberally seasoned juice and pilled into a crusty Italian bread. 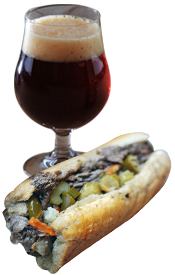 The juice from the Italian beef is filled with garlic, oregano, and Italian seasonings that a barley wine can stand up to. The intense, high alcohol barley wine doesn’t overshadow the bold taste of the beef. This is especially true when the sandwich is topped with jardiniere, a mixture of spicy, pickled vegetables.